What do I need to know if I plan on getting married during the Sturgis� Motorcycle Rally�? A: To be married in Sturgis® (Meade County) you must obtain a marriage license at the Register of Deeds office located in the Erskine Building at 1300 Sherman St., Suite 138. (1 block south of Main St.) Both applicants must be present with identification and $40 in cash or travelers’ checks. There is no waiting period, the license is good for (20) days and same day marriages are legal. You are responsible for locating your own wedding official. 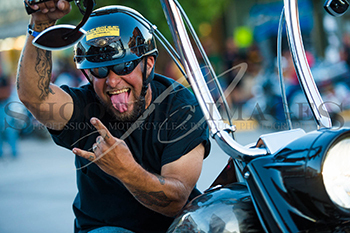 How are the Sturgis� Motorcycle Rally� dates determined? A: The first Rally, called the Black Hills Motor Classic, was held August 12-14, 1938. The first weekend in August was selected because it did not interfere with other established events held in surrounding communities such as Belle Fourche (rodeo) and Deadwood (Days of 76). Regional events were extremely important for social and economic reasons in the post depression Mid-west and as a good neighbor, Sturgis did not want to compete for those bodies and dollars. As the event grew the "official" dates grew. The Sturgis® Motorcycle Rally™ begins with opening ceremonies on the first Friday in August and ends the following weekend. The 2018 Rally will run from August 3 to August 12. Are helmets required in South Dakota or neighboring states? How does Sturgis organize and accommodate an event this size? A: Sturgis has approximately 6,700 residents, but it doesn't know it's considered a "small town" because each year during the Rally when the population nearly doubles that of the entire state, Sturgis steps up and manages one of the oldest and arguably the largest motorcycle gathering in the world. The community has had 78 years to get it right and is successful because of a combination of factors, number one - cooperation. 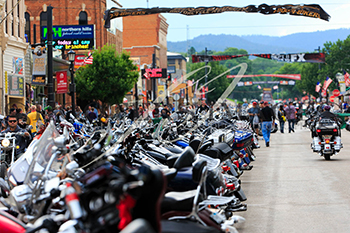 The year-round planning process is facilitated by the Sturgis® Rally Department, a department of the City of Sturgis. However, all city departments to include Police, Fire, Water, Streets, Parks and Finance play a role in making certain the event is managed professionally and competently. Each year is a learning process and part of that process includes changing to meet the needs of the community and our 500,000 visitors and exhibitors, ensuring the event not only continues but continues to flourish. Sturgis also relies on state and local government agencies and civic organizations to provide aid and assistance. But the heart and soul of the Sturgis® Motorcycle Rally™ are the citizens of Sturgis who open their arms, business and homes each August and understand the importance of hospitality and friendship. How are the Sturgis� Motorcycle Rally� attendance figures determined? A: Rally attendance figures are estimated based on a formula that has been used for the last decade, gathering data from different agencies and areas in the Black Hills to arrive at a plausible number. The five sources are: Department of Transportation traffic counts taken throughout the week at the entrances to Sturgis and other Black Hills communities; the number of vendor licenses issued in Sturgis, tons of garbage hauled in Sturgis, Mount Rushmore traffic counts; and South Dakota Department of Revenues sales tax calculations. Where can I get information on road construction in the Sturgis area? This site will give you construction info by clicking on the state you are traveling to and through. You can click on listed communities for up to date road construction (photos are available) and weather info. A great site for two-wheeled travelers, not only in SD, but across the country. Where can I get concert info and buy tickets during the Sturgis� Motorcycle Rally�? Concerts during the Sturgis® Motorcycle Rally™ are hosted by several private venues. See the Official Sturgis® Motorcycle Rally™ Events Schedule www.sturgismotorcyclerally.com for up to date concert information or contact the venues listed below. How do I protect my motorcycle and belongings during the Rally? • Be aware of where you park. • Avoid dark, poorly lit areas. • Pay attention to people standing around who seem to take particular interest in your bike. • Do not leave leathers, cameras, souvenirs, etc. on your bike. • Factory ignition switch locks are easily overcome by thieves. High-quality disc locks, wheel locks and heavy cable or chain locks are recommended in addition to factory installed devices. Inexpensive locks are generally of poorer quality and are easily broken or cut. • Determined thieves can steal any motorcycle, but common sense and taking these extra precautions will reduce your chances of being a victim. Can I fly my drone over downtown for fun or as part of my business? Use of Sound Amplification Device - Court Appearance Req. (Continued) in Motor Vehicle - Court Appearance Req. What changes were made to Main Street? Main Street was totally resurfaced and bump outs were added on each street corner. The City planted flower and trees in the bump outs to add beauty and increase the overall aesthetic of Main Street. The asphalt on Main Street was old and needed replacing. The utilities required upgrades, including the water main and storm sewer. When doing that, communities typically look at the streetscapes and upgrade and beautify at the same time when it’s feasible. When did the Project begin and when was it completed? The Project had two phases. Phase One from Middle Street to Junction Avenue began Spring 2016 and was completed just before the 76th Rally. Phase Two from west of Junction Avenue to Fourth Street began after the 76th Rally and was completed June 30, 2017. How will the experience of Main Street change? There will be no changes to the general Main Street experience for rally goers, except for a smoother, more pleasing and beautiful Main Street. Has capacity for motorcycle parking changed? Harley-Davidson Way will now be open for both motorcycle parking and vehicle traffic. On Main Street, there are approximately 40 - 50 fewer motorcycle parking spots due to the bumpouts on the street corners, but with the increased spots on Harley-Davidson Way, it amounts to nearly the same motorcycle parking capacity as before. No, traffic flow and direction remain the same. Has the capacity for vendors on Main Street changed? No, capacity for vendors is the same. How will pedestrian traffic be affected? The City upgraded the lighting and improved the sidewalks and crosswalks, including adding a midblock crossing between Junction Avenue and 1st Street. How will vehicles be affected? Just as before, vehicles are allowed on Lazelle Steet and Junction Avenue, and Main Street is designated for motorcycles only. New this year, Harley-Davidson Way will be open for both vehicle traffic and motorcycle parking. In addition, vehicles will be allowed to park on Main Street between 5th and 7th Streets. How did you address the needs of those with handicap parking needs? We added designated handicap spots on each block throughout Main Street. Riders should be sure to display their handicap permit when parking there. Take a view of the Sturgis® Motorcycle Rally™ stats.